Many foreign language teachers choose to pursue the career as a feasible means of satisfying their traveling dreams. While there is nothing wrong with that idea in theory, it can prove to be too big of a distraction if not properly focused. Yes, traveling while you are teaching abroad is an exciting opportunity that should not be missed. However, you have to keep in mind that you are in the position you are in, first and foremost, to teach your students. You will need to develop a proper work-life balance in order to maturely handle your professional responsibilities with your extracurricular and social activities. The language barrier is an undeniable hurdle when it comes to teaching English as a foreign language. Fortunately, there are several ways to work around the obvious obstacles it presents. For starters, find creative and logical ways to avoid using oral language as your sole means of communication with your students. For example, they may not understand when you say a certain term or phrase, but they will understand when you show it to them. Take the word “apple.” Young students are more likely to understand what you mean when you use the word if you show them a picture of it at the same time. Better yet, bring a real apple to class. Allow the students to pass it around, feel it, smell it. Another simple and fun solution is to have your students act out new terms and phrases whenever possible. If action words such as “run,” “jump,” “fly,” etc. appear during our lessons, I often allow the class to take a moment to act out that action. It serves as a fun break for them and is a useful trick for having them remember the words. Get creative! – What salary are you being offered; how does it fit within the region’s cost of living? – How difficult/easy will it be to obtain your visa? – Does your school/company reimburse you for airfare? Visa costs? Rent? – Are you offered health insurance? – Is your apartment conveniently located? Near your school? Near public transport? Near the city’s social spots? – How many teaching hours will you be expected to do per work? How many office hours? – What kinds of professional development opportunities will be available? – What grade level(s) will you be teaching? – Will you be teaching oral English? Reading? Anything else? – What extra responsibilities will be expected of you? – What is your pay schedule? Prioritize your students’ education, use creative methods, and prepare more materials than necessary. Doing all of this while keeping the above questions in mind will allow you to be off to a great start in your TEFL career! 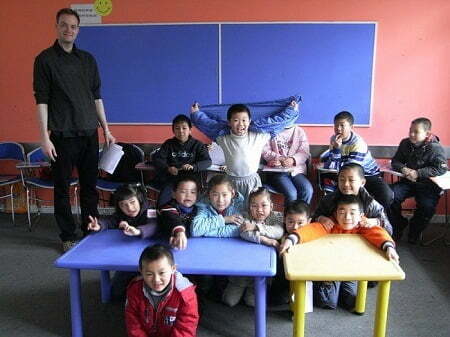 Brendan O'Shea is an EFL teacher, freelance writer, and wannabe world traveler living in Shenzhen, China. Between exploring new destinations, Brendan enjoys reading, playing chess, and following sports. Follow his teaching and traveling journey on Twitter and Instagram, or read up on his experiences on his personal blog: Teach and Travels!